The best food is often the food you make yourself. Recently we purchased a pasta roller and cutter attachment for our Kitchen Aid stand mixer. They are incredibly nice and well built. They simply attach to the top of the stand mixer and to the internal gearing. With the roller you can adjust the width so you can roll out sheets that are thick or thin depending on your taste. 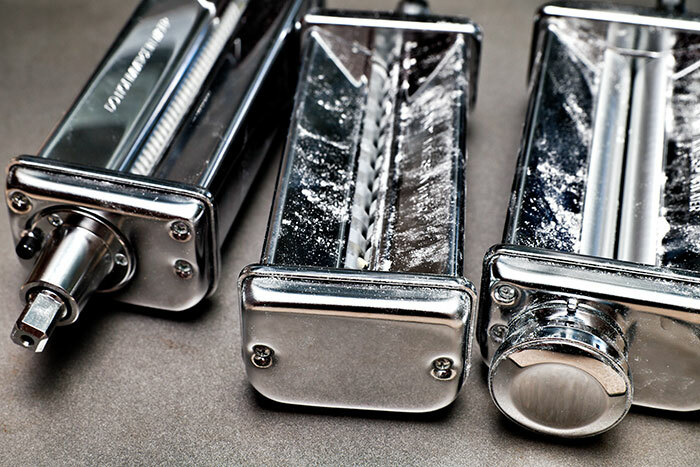 The two different cutters make either fettuccine or spaghetti noodles. If you’ve never had fresh pasta you don’t know what you are missing. We had always purchased the hard dried pasta in the packages at the store. The break ’em and boil ’em kind. After my wife made her first batch of fresh pasta I couldn’t imagine ever going back to the dried stuff. It’s that much better. The fun part is that you can make any kind of pasta you can imagine. For example, tonight we had a regular noodle, a spinach noodle and a carrot noodle. My favorite however is a lemon noodle. The pasta roller and cutter attachment definitely makes it so easy to enjoy fresh pasta at home. When it comes to photographing shiny reflective objects things can get a bit tricky. When you photograph a subject like these shiny chrome attachments you not only take a photo of the attachments but also whatever is around it as it is being reflected in the metal. This is new territory for me so I picked up a great book on lighting called Light Science & Magic by Fil Hunter, Steven Biver and Paul Fuqua. It’s turned out to be a fantastic book that isn’t your typical how-to book but a book that teaches you to understand light and how it works. I’ve already learned quite a bit just from the first few chapters and I plan on writing a few posts for the Get To Know Your Camera series that I will be launching soon. It’s going to be all about learning what all those dials and menu settings do on your camera. You can check out more photos on my Flickr site.